South Australians could go back to the polls within two years if SA Best holds the balance of power, with Nick Xenophon threatening to pull his support from any government that doesn’t achieve electricity price reductions of 20 per cent by 2020. And the SA Best leader said he’d personally resign if his own plan to put downward pressure on power prices didn’t stack up. Xenophon this morning announced his long-awaited suite of energy policies, the centrepiece of which was the establishment of a not-for-profit community electricity retailer that he insisted would unlock cheaper power for households with annual incomes of up to $75,000 and small businesses with power bills under $20,000. The document also flagged a benchmark for whoever forms government with SA Best’s support to reduce power prices for SA consumers by at least 20 per cent within two years. 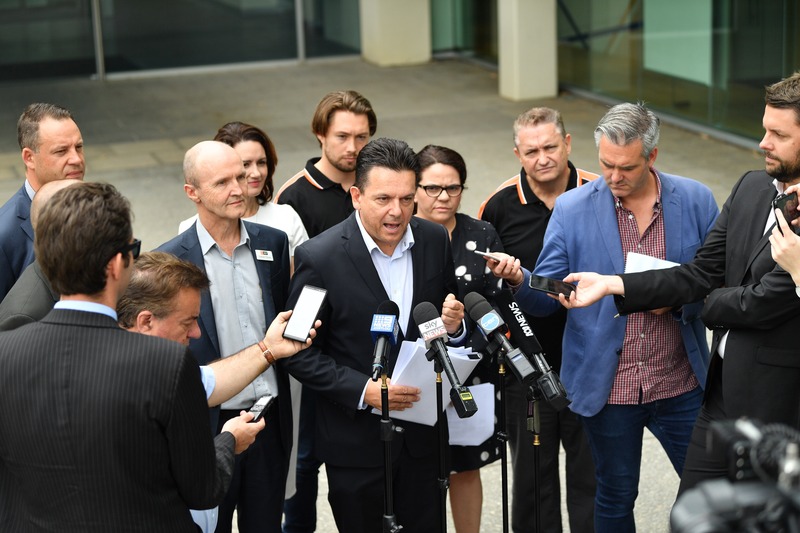 “Energy prices has to be one of the key issues of this campaign and SA Best wants to hold the next government of SA to account, to ensure that energy prices are cheaper and reliable,” Xenophon told reporters. “To put it in blunt terms, SA Best is all about ensuring that if the next government of SA does not bring energy prices down by at least 20 per cent in the next two years, and ensure that the lights stay on, then in our view the lights should go off in the Premier’s office. He confirmed that meant he would commit his party to withdrawing support from any power-sharing arrangement, which could then see it either throw its support behind whoever is in Opposition to seize power or force the Government to an early election. “This is about putting the torch on the next government of SA, and holding them to account,” Xenophon said. “What it is, is very simply this: if the next government of SA can’t keep the lights on and can’t reduce energy prices by 20 per cent within a two year period – something that is achievable – then they shouldn’t be in office, simple as that. Whether SA Best’s own price-reducing suggestion – a community electricity retailer, to be named the Community Electricity Trust of SA, or CETSA – would be part of the next government’s suite of energy policies remains to be seen. The plan would see the new retailer enter into a tender process for a power purchase agreement to develop a 150-megawatt dispatchable renewable energy power station, in a bid to add competition to the generation market. The State Government would act as guarantor for the power purchase agreement “to give investment certainty”. Xenophon expects up to 50,000 households and up to 5000 small businesses will sign on to be part of the community co-operative, whose members could expect to see their prices come down by his magic figure of 20 per cent. The increased competition, he says, would, in turn, put downward pressure on the electricity market more broadly, with CETSA to have the option of contracting out its retail activities to a “smaller independent retailer”. But he concedes the plan, whose assumptions are predicated on modelling by the Australian Energy Market Commission has not been independently costed or modelled, nor had it been submitted to the parliament’s budget advisory service because it was “not within their remit”. “The other two major parties have much bigger budgets than we do,” Xenophon said. “We are not being prescriptive – if we were in balance of power position we would want there to be a proper process of good governance, having the appropriate modelling carried out [but] we believe this makes sense, in that there is a gap in the market for a community electricity cooperative that doesn’t exist in SA [and] that’s worked well in other parts of the world… we think this model will work and drive down prices, particularly for those vulnerable consumers and vulnerable businesses. He said if the plan failed to reach its own benchmark, “obviously we have to stand or fall on this as well”. And he conceded he’d stand down if the plan didn’t meet the same benchmark he’d set for the major parties. “The short answer is yes – I’ll put my money where my mouth is… if this project goes ahead and it doesn’t deliver what the modelling says it will, then I’ll fall on my sword. But he said the proposal would have to be introduced as part of a “suite of policies” focussing on “grid stability, grid security and ensuing capacity in the market”. Xenophon believes prices could move before major projects are fully realised, because “if you know there’s going to be new capacity in the market, that actually drives those hedge contracts in terms of prices”. He said Government projects such as the big battery, solar thermal and virtual power plant “will all drive more supply and take pressure off the grid”. But he was less enthusiastic about the Liberals’ commitment to building a NSW interconnector, saying he supported such a proposal 20 years ago and the then-Olsen Government “was adamant they didn’t want it”. “Times have moved on now… where were the Libs 20 years ago when they fought tooth and nail against an interconnector? The irony does not escape me,” he said. He defended the oft-delayed release of the energy plan, saying “we’re all stretched because we’re all working 18 to 20 hours a day and we wanted to get the numbers right, and we wanted to have a considered approach and discuss it with our colleagues”. “It’s still out 24 days before the election… if that’s not good enough, well shoot me,” he said. The SA Best plan would also include new incentives for landlords to install solar PV systems “so that their tenants share the benefits through lower power bills” – a measure applauded by the welfare sector. Uniting Communities spokesman Mark Henley, who was present at the policy launch, said electricity affordability was “the number one presenting issue for people coming to our financial councillors”. “We suggest about 40 per cent of households struggle to pay bills at some stage during the year, and the biggest group of those are renters… private sector tenants, and this is the group SA Best is looking at providing support to,” he said.